So, you have been reading the Healthy Boy blog over the last month or so and have seen some great results just from making a few small changes to your diet and workout routine. But things get in the way. Work has been crazy busy, you haven't been able to find the time to get to the gym every week, and those specials they have had at the grocery store on red velvet cupcakes have been just too tempting to pass up. You need some motivation to get you back on track but you can't afford a personal trainer and don't know where to start. Well, swallow that last cream puff and throw out all that soda you have stock piled, because if this doesn't get you motivated then I don't know what will. I get emails daily from devoted Healthy Boy readers telling me about their success stories but asking me what else they can be doing to get motivated. Well When it comes to getting in the best shape of your life, sometimes all it takes is a big juicy "carrot" to really get your motivational juices flowing again, and Tom from Burn The Fat is now wiggling that carrot right in front of our faces. This week Tom has launched what they are calling "the world's first body composition transformation contest." Meaning it is not just a weight loss competition, like the Biggest Loser for example, but a contest to see how much fat you can lose and how much muscle you can gain. 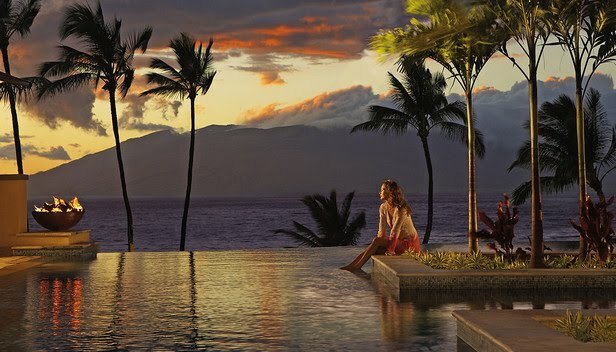 They're sending the winners to one of the world's most luxurious resorts in Maui - The 5-Star Four Seasons on Wailea beach. I saw the photos of this place, and I have to admit, even I am tempted to enter this contest. And you can win a dream vacation trip there - 7 days and 6 nights in tropical paradise... All you have to do is get in shape! Really. Get in shape. Go to maui. Of course, there may be a few thousand other people who want that vacation too, but that's the fun of it - this is a body transformation competition. When you accept this challenge and enter the Burn the Fat contest, you will not only take before and after pictures, you will also measure your body fat percentage so you can be judged visually and numerically on your improvement in body composition. I know a lot of you have already purchased the Burn The Fat book and are loving the info Tom has in there and are already seeing great results. The good news is, if you have already bought the book, you can enroll in the competition for free. the contest. not just this contest, but every burn the fat challenge in the future... forever. You can also get entered in the contest by getting a membership to the Burn the Fat Inner Circle - the private members-only motivation and support community where the contest is being held. That's good for Healthy Boy readers who want extra support and accountability. Not only that but if you do enroll, please let me know because I will feature you on regular posts on my blog where I will post pics of your progress and we can all see how you are doing and provide you with further support. Registration is only open until Sunday, May 30th. flowing, I don't know what will.